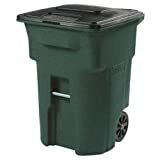 If you want to buy the best outdoor wheeled trash can and you have no idea which one would fit this bill, you came to the right place. Many folks think that a good trash bin is one that can be operated with little effort and that keeps various animals at bay. Depending on where you live you might have slightly different needs, however there are some important features to keep in mind before deciding to part with your money. An uncovered trash bin is like an open invitation for many animals to come have a meal. A can that has a lid on top will prevent the scent to spread and attract critters. There are many trash bin models that do have a non-attached lid, but this means the collectors will just throw the lid on the ground, even if they risk breaking it. Losing the lid is another risk you take if it’s not attached to the bin. With the lid attached, you can be certain it won’t get lost. Many trash collectors are not paying attention when handling the bins or their lids. This means the items can get scratched or broken much faster. A hinged lid means the chances of discovering a split lid are reduced. A wheeled waste bin is very easy to push or pull, even when completely full. Most cans with wheels have just 2 of them, but there are some models with 4 wheels. The later models might not be as stable as the former and should probably considered by people who have difficulties in operating the models on 2 wheels. Bins with no wheels need to be dragged and this can cause them to wear out much faster than the ones with wheels. The best outdoor garbage cans with wheels have a standard design. Such a design makes them compatible for the automated lifters in which they are emptied and the workers only have to open and secure them in place. Outdoor trash bins will get dirty faster, both on the inside and on the outside and you might want to clean them from time to time. Some manufacturers created models with a plug at the bottom to allow for easier clean-up. 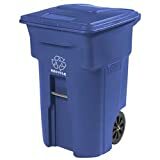 Most trash cans are made of metal or plastic and each type has its own advantages. Garbage bins made of metal are usually sought after in areas where bears are also known to roam. They also keep other type of critters away from your trash. Their disadvantage is that if they get scratched, they risk getting rusted. Plastic on the other hand allows some animals to chew right through. Bears also might be easily able to feel the scent of the waste. However, this material doesn’t rust even when scratched. An important part of the design is the finish. A good bin will have a special type of finish or a dark enough color that will protect their appearance no matter how rough they’re being operated. You might want a bin of a different color if you need to recycle. Some models have a recycling mark on them to set the waste apart from the rest of the garbage. Depending on where you live, you might be required to get a trash can of a certain color or with a certain finish. You might even have to buy a specific brand or size. Make sure you know exactly which are the requirements as not to have the unpleasant surprise you got the wrong item. Trash bins come in many different sizes, as not everyone creates the same amount of waste at the same rate. A large family will probably need a bigger waste can than a single person. If you cook a lot, you might also have more trash than someone who doesn’t cook at all or just does so once in a blue moon. Sizing matters also when taking into consideration how often is the trash picked up. Finding bags that fit the bin can also be an issue. The bigger the product is, the heavier it becomes as you discard stuff in it, and as a result it’s also more difficult to maneuver. Most trash bins come with some warranty. The most reputable brands offer up to 10 years of warranty. However, you should know that taking advantage of the warranty is not always possible since the outdoors bins are large and quite heavy products. Returning them would be expensive and almost no seller or buyer is willing to pay for this. Perhaps the user reviews are something you ignored before, but with so many options available today, knowing what others think of an item is vital. It’s a good idea to ask either your neighbors, the trash collectors themselves or the company providing the service about this. They’ll be able to indicate a product that is compliant with the city regulations, if any, and that will also better match your needs. Now that you have a better idea of what to pay attention to when shopping, it’s time we saw some of the best or most popular trash bins on the market. 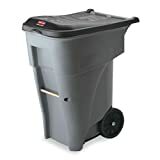 The Rubbermaid Commercial Roll-Out trash can is suitable for both indoors and outdoors use thanks to its sturdy build and commercial-grade materials. The professional, rugged wheels prevent the trash can from sliding which adds safety regardless of the surface type. 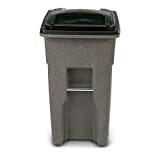 This trash can features an ergonomic handle for a secure grip, and a lid that stays in place while being transported. Available in different sizes (32, 50, 65, and 95 Gallons), the item is a good choice for any sanitary maintenance task. The bin withstands heavy usage as well as tough conditions and comes in 2 different colors: blue and grey. This Rubbermaid heavy duty trash can provides secure transport for any type of waste. The 8 inches rubber wheels offer good performance even on rugged terrain, while the lid is attached and doesn’t move out of place during transport or when being opened. The handle has an ergonomic design and is flexible, which makes it comfortable to use. This bin has a tough built for improved durability under any type of conditions. Weighing in at 18.9 pounds and measuring 35 x 28.5 x 23.5 inches, the item is light enough to be easily carried. The Vestil TH-32-GY waste container features a hinged lid with handles on the sides for easier transport and comfortable use. The trash can is suitable to use even during rain as its hinged lips don’t allow water to come in. Its large and rugged wheels make transport convenient and safe against slipping. The container arrives already installed, so you don’t have to worry about setting it up. Build from heavy duty materials, this item is sturdy and protects against raccoons and other animals. This bin weighs 20.1 pounds and measures 22 x 18.5 x 37.5 inches. 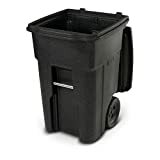 This 95 gallon trash can is a heavy duty waste container that features a single handler for a secure grip. Its ground hugging bottom provides extra stability on any surface even under strong wind. The trash bin includes molded-in lift points and foot tilter that make it easier to carry heavy loads. The item weighs 35.5 pounds, and offers durability against scavengers and bad weather conditions. The hinged lid keeps the interior protected against opening, and the container is fully waterproof. The trash can features 2 large wheels that are rugged, and an inset wheel position that keeps the walls from getting damaged. 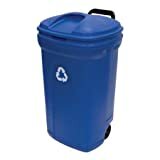 If you need a sturdy trash can for the indoors or outdoors, have a look at the United Solutions 34 Gallon container. The bin features 5 inches wheels which are large enough for transport to any location. The container is ideal to use for medical waste but also garden compost and chemicals. Built with locking handles that provide a better grip and a friction-fit lid, this trash bin can become a reliable garden accessory. However, previous customers noted the material is not sturdy enough to last and the lid is easily breakable. The product measures 21 x 18.5 x 36 inches and is easy to pick up or move. Here you have a rolling garbage can with a standard design, so it is compatible with the lifters as well. The item is available on several colors as well as a version for recycling. It is made of polyethylene and it has a plug to make it easier to clean and drain the water in it. The wheels and the handles on the lid help you operate it in a more convenient manner. Some customers had issues with the lid splitting despite it being attached to the bin. If critters worry you, it’s really easy to secure it with a bungee rope. If you need your recycling waste to stand out more, perhaps you can check out this Toter bin. Toter’s recycling can is designed to be compatible with both automated and semi-automated curbside vehicles. The can has a special finish that allows it to look like new for longer no matter how rough the handling is. There are 3 sizes to choose from, which is always a plus. Some folks might find the wheels a bit noisy, especially when pulling it on concrete. Here you have a bin that can be used both indoors and outdoors and that doesn’t need tilting. This is thanks to the 4 wheels installed on the product so all you have to do it push it around. Its design is standard and that means compatibility with auto-lifters. While the lid is attached to the trash bin, it does open fully to allow the contents to fall out. This product is made of commercial-grade resin, a feature allowing it to resist in temperatures of 0 degrees Fahrenheit. With a seamless construction you know that cleaning it is a piece of cake. If you’re searching for some heavy duty trash cans created by Vestil, this one shouldn’t go ignored. It has a capacity of 64 gallons and it is almost 40 inches tall. Thanks to its rubber wheels pulling or pushing the bin around will be very easy and comfortable. This model also has a hinged lid, therefore you can be certain it won’t go missing. There are also 2 handles on the lid so opening and closing the can doesn’t also mean getting more dirty than needed. There’s one thing to pay attention to though: not throwing anything hot in it as it could melt. The warning is clear on the lid as well. 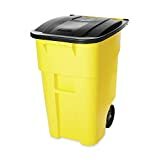 If you want to be sure that the lid of your new trash bin won’t get lost or thrown around, then you should probably consider investing in this Toter can. The lid comes attached to the bin and won’t come off that easily. It comes equipped with rugged wheels and a handle that was placed at a comfortable level. The trash bin model was molded from recycled materials, and this process made a more resistant product. Its color and finish were carefully chosen so that the appearance will remain unchanged no matter how hard the item will get maneuvered. This is the 48 gallons model, giving you plenty of space for your waste. Here you have a 32 gallon trash can that is easy to move around thanks to its wheels. Some people would have the impression this bin is a bit too thin for their needs or for a more rough manipulation, but the material is very resistant. Speaking of the material the bin is made of, up to half of it comes from recycling. It has a standard design and this means most waste truck lifters can empty it. Many people worry about the lids of their bins getting lost or damaged during trash collection, but this is not the case with the Toter can model. At 32 gallons of capacity, this trash can may be too small for some households. Among the large trash cans with wheels the 96 gallon made by Toter stands out. The product is easy to tilt even when full to the rim and it has handles on the front as well to make it even more easy to maneuver. The model here has a special finish that hides most scratches that happen due to a rougher use. If you consider yourself an eco person, then this can should definitely interest you as it is made of up to 50% recycled materials. You can take all of it to the recycling center when it is no longer good to use. 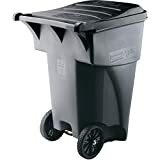 If you want a trash bin with a large capacity, the one sold by Rubbermaid Commercial Products might be a good solution. It can hold up to 96 gallons of waste, which could be more than what some households would need. Manoeuvring this trash can won’t be an issue as it has 2 large wheels and handles, making the process a breeze. While it does have an attached lid, the product might not be strong enough to keep critters away. The bin’s yellow color will make it stand out from other similar ones. It also has a standard design for lifters to empty it. At this point you should also know what features to pay attention when trying to purchase a new trash can, no matter where would you like to use it. Remember that the features mentioned in the beginning are the same whether you shop online or in a box store. Hopefully you’ve seen enough garbage bins with wheels to get an idea of the most popular brands and models. Remember that what others think is a perfect fit for their needs, might not be good enough for yours, as not all families produce the same amount of waste.